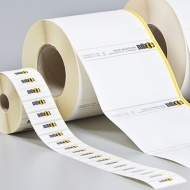 We are experts in adhesive labels and offer valuable experience for labelling solutions using various papers, foils and composite materials. Do you have high expectations for your labels? We offer solutions from a broad range of products, including standard and special materials. A competent team is waiting to assist you with questions about utilisation and areas of application for the labels. We find an individual solution to your request. From the smallest run up to a printing run of a million, blank, uni-coloured or multi-coloured printing, in the most varied shapes and sizes, we can realise your ideas and desires by using our expertise and many years of experience.